As with all disorders of the mouth, an accurate diagnosis by a trained healthcare professional is required before treatment is started. As with all disorders of the mouth, an accurate diagnosis by a trained healthcare professional is required before treatment is started. This is particularly important for canker sores (recurrent aphthous stomatitis / RAS / aphthae), since several other conditions can cause ulcers in the mouth that may mimic typical canker sores. Some conditions that can mimic canker sores include traumatic injury, autoimmune conditions, viral infections (such as herpes simplex and herpes zoster [shingles]), and most importantly, oral cancer. In addition, oral ulcers can be associated with a number of systemic conditions in which the oral ulcers represent only a small part of the underlying problem. A general rule of thumb recommended by health care professionals is that any ulcer that lasts for more than 10 to 14 days should be evaluated by a dentist and biopsied if necessary. Professionals trained in Oral Medicine have expertise in the diagnosis of such lesions. The discomfort and severity of canker sores can roughly be categorized as mild, moderate, or severe. Mild disease is characterized by its infrequent occurrence, short duration, and lack of severe symptoms. 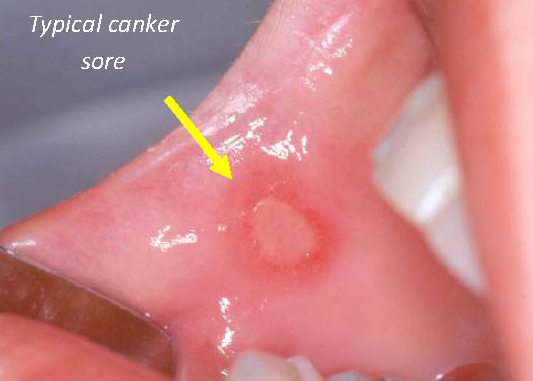 Fortunately, most patients who experience canker sores experience mild disease (see right). While there is no formal classification to distinguish between moderate and severe disease, the presence of four or more canker sores per year with annoying but non-debilitating symptoms can be classified as moderate disease. Severe canker sores are often more widespread, more painful, and interfere with the patient’s ability to eat and speak. Unfortunately, individuals with severe disease often suffer frequent to constant recurrence. In general the goals of treatment are threefold: to decrease pain, speed healing, and prevent recurrence. Currently, no available therapy meets all these goals, although most therapies do provide some benefit to those affected. A large number of therapeutic agents are available, including both prescription and over-the-counter (OTC) preparations. The mode of administration can be topical, systemic, or a combination of both. The method selected depends upon the site of the lesion(s), accessibility for treatment, severity, duration, and success with previous treatment regimens. 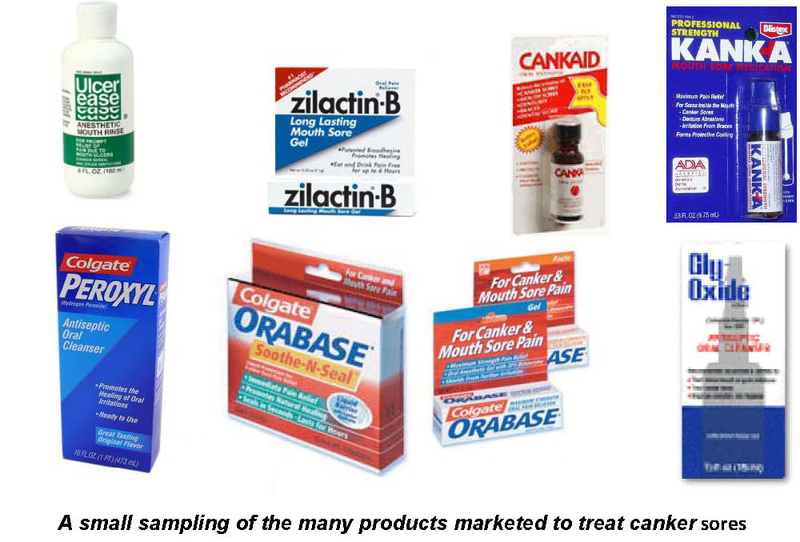 Below is a brief discussion of the many choices available for the treatment of canker sores. These agents may relieve pain or reduce the inflammation that causes the lesion. Before using any agent it is recommended that you consult your dentist. If needed, an expert in Oral Medicine may be consulted concerning the need and feasibility of more advanced treatment protocols. OTC preparations for treatment of RAS fall roughly into four categories: occlusives, anesthetics, cleansing agents / antiseptics, and other. OTC products often combine multiple categories in order to increase effectiveness. Occlusives or emollients are protective coatings that block irritation of the ulcer and associated nerve endings by providing a surface covering that shields the site from mechanical irritation; stimulation from acidic, salty, or spicy foods; and temperature changes. These coating agents are pharmacologically inert substances. They generally provide relief as long as they are in place, but it can be difficult to keep them adherent for sustained periods. When protective coatings are combined with a therapeutic agent, a two-fold benefit is obtained. The occlusive prevents external stimulation of the wound site and also holds the therapeutic agent in place. Representative products in this category include Zilactin® and Zilactin®-B, Orabase®, and Orabase® Soothe-N-Seal™. Anesthetics provide symptomatic relief and are often combined with other agents. The most frequently used agent is benzocaine 5 – 20%. However, benzocaine is a known allergen and should not be used by patients with hypersensitivity. Many OTC anesthetic products are available. Cleansing agents/ Antiseptics can cleanse the area and decrease the number of bacteria on the ulcer surface. Products that release oxygen can be used as cleansing agents. The foaming of the oxygen exerts a mechanical action that loosens debris and cleanses the wound. Products in this category include Amosan®, Cankaid®, Gly-Oxide®, Orajel®, and Peroxyl®. Hydrogen peroxide when obtained as a 3% solution should be diluted with equal amounts of water before application either directly to the ulcer or as a mouthrinse. Sodium bicarbonate, either as a solution (½ to 1 teaspoon in 4 ounces of water) or as a paste, can also be used to for wound cleansing. Other Approaches include the use of mild cautery or caustics to deaden nerve endings and decrease symptoms. All OTC agents in this category are mild. An available OTC product is ORA5. A professionally applied or prescribed product Debacterol® is also available for nerve deadening. Professional care is recommended for moderate to severe lesions. Individuals with advanced training in Oral Medicine have additional expertise in managing more severe cases. In many instances, topical therapy with a potent corticosterioid may be prescribed to reduce the immune response in the area. Finally, in some cases the use of systemic corticosteroids or other immunosuppressive drugs may be warranted. Final Cautionary Note: Because canker sores can be caused by systemic abnormalities and also be confused with other pathologic conditions that present as ulcers, it is important to seek professional attention if lesions do not resolve within two weeks. Q: Do OTC agents work? A: Many patients obtain some relief using these agents. Use of OTC agents is intended for mild to moderate disease. Since 1972, the Food and Drug Administration (FDA) requires that all new OTC agents must be safe and effective. Q: It seems like I always have canker sores. Is there any help for me? A: Individuals who have frequent canker sores should seek professional assistance from a dentist and/or be referred to an expert in Oral Medicine. The assessment of your particular situation may be extensive and necessitate consultation with other health care professionals. For example, your dentist may order dietary surveys and blood tests to help rule out the presence of food sensitivities or other systemic causes. Prescription medications may be necessary to best manage your disease. Q: Can canker sores be caused by an allergy? A: Yes. However, identifying the particular allergen can be challenging. This is an area where the individual patient can contribute to his or her care. Strategies for identifying potential allergens include observing any relationship between the intake of a particular food or beverages and development of canker sores. Many individuals are intolerant of wheat products (gluten), nuts, tomatoes, and various fruits. Two frequent food additives that are associated with canker sores are the spice cinnamon and benzoic acid (a common preservative found in foods and soft drinks). A trial elimination of a suspected food substance or additive is a sound approach to identifying potential allergens. Q: Can I use a mouthrinse to prevent canker sores? A: While not specifically marketed to treat canker sores, the regular use of Listerine® (OTC) and Peridex® or Periogard® (Rx chlorhexidine gluconate) may lessen the pain of canker sores. However these rinses often do not prevent recurrence.